Virtually unknown to the public or historians, White House photographers have developed amazing access to the presidents of the United States over the past half-century. In this book, long-time White House correspondent Kenneth T. Walsh tells their stories, emphasizing observations about the presidents the photographers got to know so well along with other key figures close to those presidents-including the first ladies, members of Congress, and important world leaders. This book shows how official White House photographers have morphed into ultimate insiders within the American presidency, allowed to observe and take pictures of nearly everything Chief Executives do related to their job. The "photogs" have often become close friends with the presidents they have served. Using these bonds of trust and their own powers of observation, they created fundamental impressions and public images of the presidents through the art of photography. Acting not only as image makers but as visual historians, they have built pictorial chronicles of the presidency-intimate narratives of America's leaders in public and private, showing how they dealt with everyday life as well as moments of great crisis and opportunity. From children playing in the Oval Office to decisions to send troops into harm's way, images created by White House photographers can make or break a presidential administration as well as define an era. The president's "bully pulpit" at the White House is commanded as much by the visual as the verbal. This new book significantly captures this truth in a wonderful collection of images that have shaped our nation's history, along with the personal stories of the artists who "did the snaps." A must for every student of White House history. Kenneth Walsh has become one of America's great chroniclers of all things presidential. Ultimate Insiders is a marvelous look at the role White House photographers play in setting the tone and tenor of our times. Highly recommended! Remember the picture of Kennedy sheepishly walking away from Marilyn Monroe. Or of Reagan meeting Gorbachev. Or iconic shots of Obama's anguish in defeat and Trump's frustration with the swamp. The only people in the world close enough to touch the people in these photos are the presidential photographers, but we only see the back of their heads. 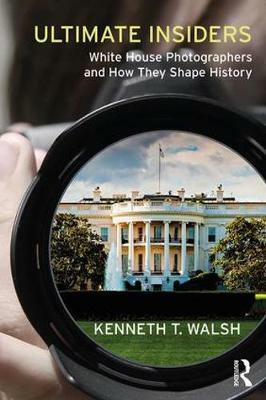 In this book the consummate historian of the modern presidency, Ken Walsh, has given them all faces. Walsh's book describes and tells the stories of the characters, charmers, egos, and true believers who photograph the lives of our presidents. It's a great read. Ken Walsh, veteran White House reporter, gives us a fascinating and well-written account of the presidential photographers who have chronicled our presidents. The book looks at the untold story of who these people have been and, in doing so, explicates the power and politics of images that have shaped every presidency in the modern era. More often than not, a single photograph can tell a story with more detail than a news article ever could. Kenneth Walsh expertly conveys this message, taking readers behind the curtain of the White House and into the most intimate moments of a president's time in office. He shows readers the important role of White House photographers and how our history is lost without them. Kenneth Walsh captures the extraordinary "snapshots" that provide context and texture to a full view of our presidents. Well done! In Ultimate Insiders, Ken Walsh tells the story of one of the most exclusive clubs in photojournalism: personal photographers to the President of the United States. Behind-the-scenes stories and intimate portraits of the brilliant men and women in this club are preserved forever here... Ken Walsh's book is an affecting portrait of this work and the special people who have practiced it. This is one of the most fascinating books I have read in a long, long time. It informs, it inspires and it humanizes the various presidents that Kenneth Walsh has been fortunate enough to work with. The stories and anecdotes will make you feel as if you too were standing next to history.